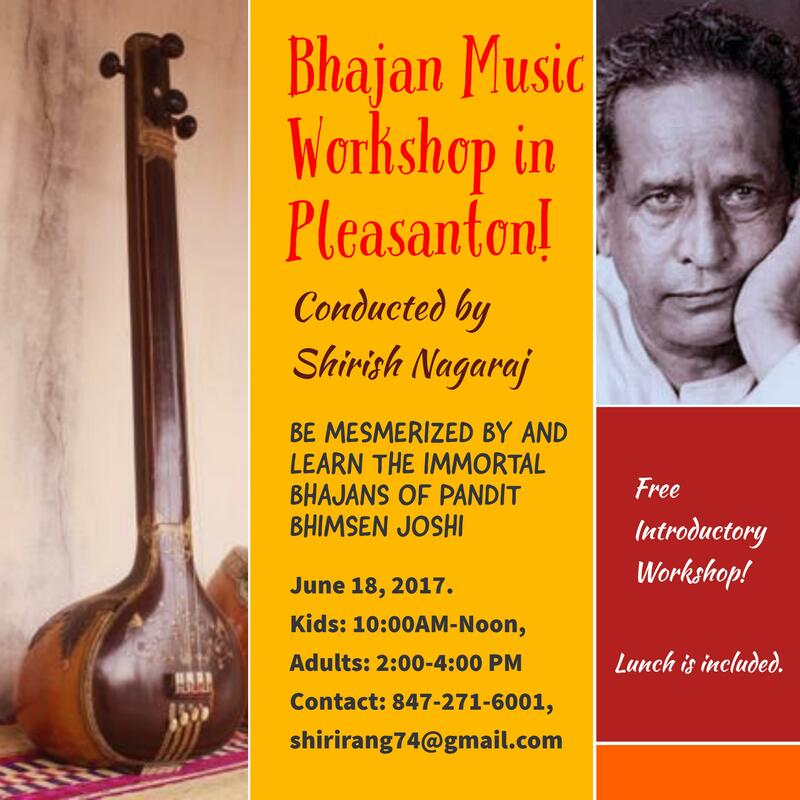 Hindustani Vocal Mussic lessons will be imparted to adults ( preferably to students above 17-18 years of age) by experienced teacher and performer in Pleasanton. Online classes are also available.Please contact for further details. I have studio in Danville,near Camino Tassjara, offer private piano lesson, music theory class and AP music theory, special introduce our Double bass teacher. Studio provide ABRSM( The Associated Board of the Royal Schools of Music (ABRSM) is an examinations board and registered charity based in London, UK)piano and theory exam. I also offer ARSM(for students who passed ABRSM level 8 only). 50% students from my studio do exam and US Open piano competition or Carnegie Hall and Lincoln center Competition NY. Only accept students mid to senior level. Serious students only. Currently not accepting beginner students. Exam and competition students only. Our studio also got Double bass teacher, currently his student is California Youth Symphony bass principle. Many of his students played in OYO, BYO, CYS in our Bay area top youth orchestra. Only accept students who can take Saturday lesson only, due to very limited space. Hi, In person/online classes are conducted for beginner through advance level.We are now enrolling students for the year -2019 beginner through advance level in Pleasanton and Dublin.Students can get Sr,Jr certifications and can earn upto 16 university credits for each level along with performance opportunities.Please call me (Instructor: Mrs.Gayatri Kalluru) on 203-828-0041 for booking Free orientation and First Free class in Pleasanton,CA. My Info:I was professionally trained in Carnatic music at Dwaram Venkataswami Naidu Kalakshetram, Visakhapatnam and have a degree from Andhra University.i also learnt it from direct disciples of Sri Nedunuri Krishna Murthy Garu.I also have good experience in teaching music(10+years).Students here learn carnatic music in a methodical,professional and interesting way with both thoeritical and practical aspects of this divine art form covered. Personal attention, printed notes, and pre recorded excellent quality voice recordings of lessons as mp3s will be given to each and every student for practice. Piano concerto competition with all youth orchestra. www.ypiano.net – Visit website for more details Studio information. Yingwen Lewis- piano instruction in Danville, San Ramon. 1996 piano performance degree from New England Conservatory of Music in Boston, Massachusetts. Student of Randall Hodgkinson and Hae Sun Paik. Weekly private one on one piano lesson at my home studio. 45min/1h time slots available. Close to Blackhawk, Camino Tassajara, Gale Ranch, Sycamore Valley, and Windemere areas. Annual student recital. ABRSM (English Royal school of music) examination track option. Top students are winners of national competitions, including US Open and American Fine Arts Festival. Kids welcome! I specialize in teaching students ages 5 thru 20. Students must have daily, dedicated practice time available on a genuine grand piano, an upright piano, or a full size weighted 88-key digital piano. Hi, Inperson/online classes are conducted for beginner through advance level.We are now enrolling students for the academic year 2018-2019 beginner through advance level in Pleasanton and Dublin.Students can get Sr,Jr certifications and can earn upto 16 university credits for each level along with performance opportunities.Please call me (Instructor: Mrs.Gayatri Kallluru) on 203-828-0041 for booking Free orientation and First Free class in Pleasanton,CA. Vidushi Chandrika Pai, Founder-Director of Nada Sudha School of Music, is an accomplished Carnatic vocalist, performer, and teacher in the Tri-Valley area. Her students perform regularly in the Bay Area and have won accolades at local and national festivals. Her repertoire comprises traditional Carnatic gems, timeless Kannada compositions of Purandara Dasa and other composers, evergreen Marathi abhangs, and Annamacharya’s keertanas in Telugu. Students are provided with both theoretical and practical aspects of the vocal art form while adhering to a traditional guru-parampara style. Currently, Nada Sudha School of Music is accepting students for the 2018-2019 year at beginner through advanced levels in the Dublin, San Ramon, Pleasanton, Danville, and Livermore area. Hello Neighbors,Ashirwad Luke a music director working in Indian Film industry is visiting Bay Area June 16-27. He is conducting music workshops in San Ramon and other locations June 16-27 (flyer attached). He can teach Musical Instruments (Guitar/Violin/Drums/Flute/Saxo/…) or Vocal. He knows 50 varieties of instruments. You can learn Bollywood/Tollywood movie songs or classical songs. He Worked for Om Shanti Om/Sharukh Khan, Company, De Taali, Thoda Pyaar Thoda magic, etc.., Bollywood movies. In Tollywood he worked for King/Akkineni Nagarjuna, Aatagallu, Raajugadu, etc.., movies. Meet him and discuss about his workshop. Sunday, June 17th – Thursday June 21st, 6-8 PM. Please see the attached flyer and take advantage of the opportunity. If you are interested, please send email to:pvn25.s…@g…com. Hi Raagavihaara School of Carnatic Music is now enrolling students for new batches starting from July 14th at a summer special price of $15 for 45 mins class.Please call me (Instructor:Gayatri Kalluru) on 201-675-0379 for booking Free orientation and First Free class at my residence in Valley Trails,Pleasanton,CA. My Info:I was professionally trained in Carnatic music at Dwaram Venkataswami Naidu Kalakshetram, Visakhapatnam and have a degree from Andhra University.i also learnt it from direct disciples of Sri Nedunuri Krishna Murthy Garu.I also have good experience in teaching music(10+years) In-person classes are conducted for both beginners and advance level students(both children and adults) .Students here learn carnatic music in a methodical,professional and interesting way. Online classes are offered only for ages(above5 years).Personal attention, printed notes, and pre recorded excellent quality voice recordings of lessons as mp3s will be given to each and every student for practice. Welcome to Music N Beyond, where kid’s grow up making music. Music & Beyond is the East Bay’s premier music school serving Dublin, Pleasanton, San Ramon, Livermore and beyond. 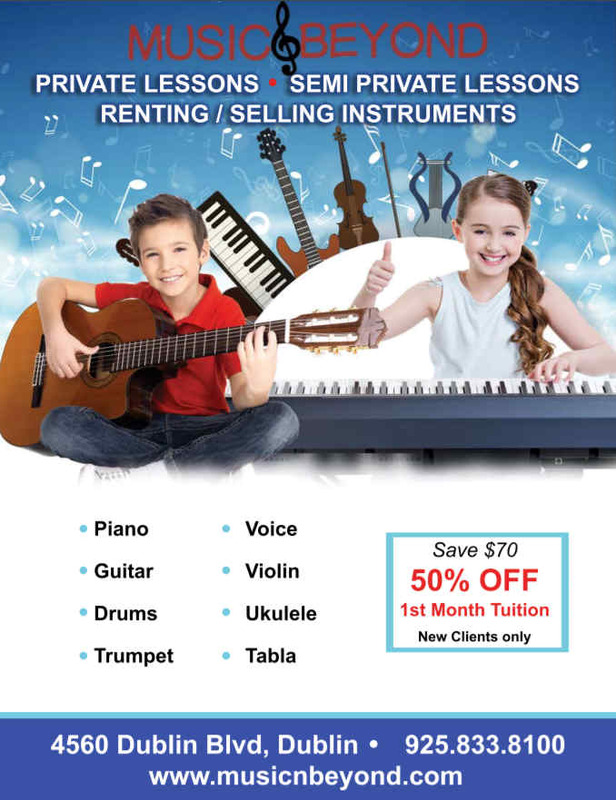 Music & Beyond offers private lessons and group instruction in a variety of instruments, such as piano, guitar, drums, voice, violin, trumpet, voice, ukulele and many more! Also, we prepared kids for certificate of Merit certification. At Music & Beyond we strive to provide a friendly learning environment where children and adults alike can develop their musical talent and gain a life-lasting appreciation for the wide musical world. Catering to any style, our teachers are competent in instructing everything from classical to contemporary music. Looking for a Carnatic Violin teacher for an intermediate student. In and around San Ramon, Dublin, Pleasanton, Danville, Livermore. 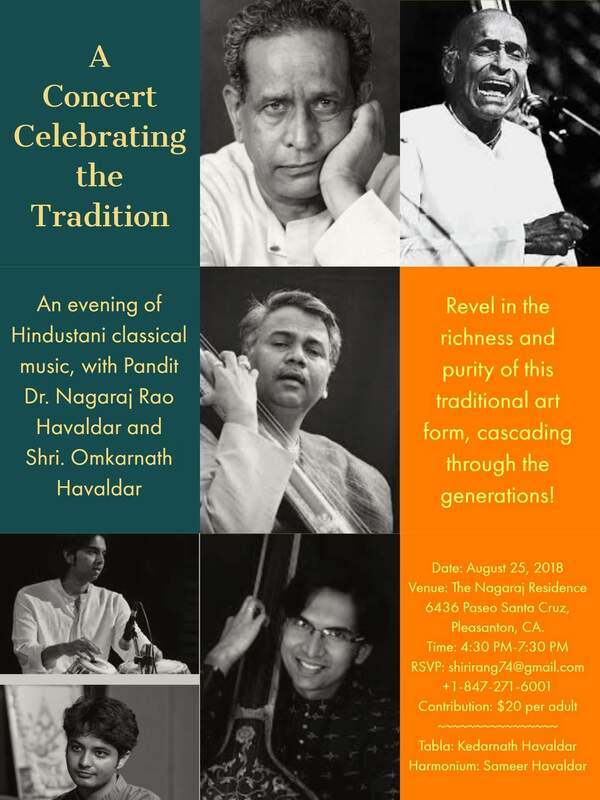 Hindustani Classical vocal music Classes are being offered in Pleasanton by experienced Indian classical vocalist.Please contact surilasanga…@g…com for further details. Starting Carnatic Music Classes for kids from 3 and above from 11/30 Thursday at 6:30 pm in Pleasanton. To register or for more details, please send email to m.vjaya…@g…com. With 40 years of experience Prema Hiriyannappa taking new students for Carnatic music and slokas for seniors. Located in Pleasanton. Please contact 925 426 0107 or 925 368 0207. Hi , Iam Sumitra I live in San ramon …am going to start Carnatic music class for kids from Oct. Kids will learn the basics with small slokas and devotional songs. Institute of Indian Music Bay Area in affiliation with Sarbabharatiya Sangeet-O-Sankskriti Parishad (SSSP) is organizing a workshop of Indian Vocal music. It will be conducted by eminent singer, performer and trainer from Kolkata – Sri Alak Roy Choudhury. I am looking for a piano petal extender for my child so she could reach the petal. If you have one for sale or try to get rid of, please contact me at 510-325-3982. Thank you. 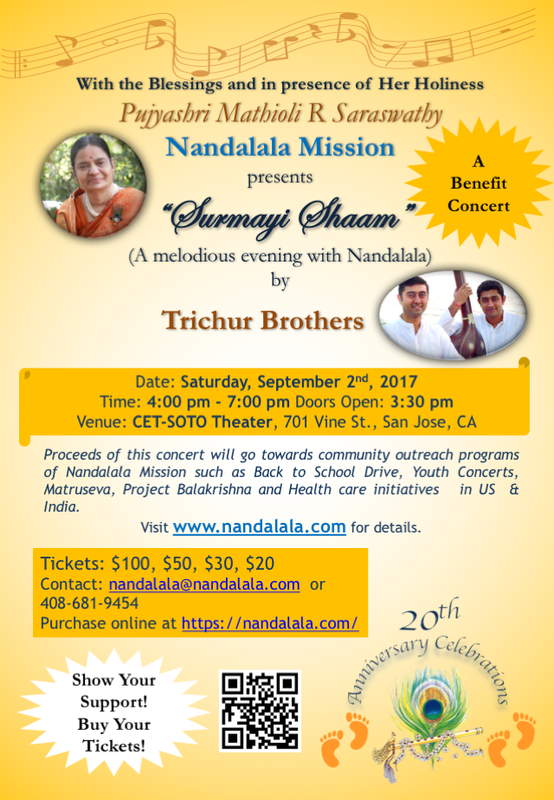 Nandalala Mission presents a Carnatic concert Surmayi Shaam by Trichur Brothers on Sep 2, 2017 , 4:00 – 7:00 PM at CET-SOTO Theater, 701 Vine St, San Jose. It’s a benefit concert. An acclaimed Mridangam Teacher, Vidwan H.S. Sudhindra is visiting and staying in Pleasanton from August 12-Sept 10. He will teach beginning and advanced students privately or group. Workshops are beginning August 12. Classes are intense and rewarding. For this month are $45/hour for private regular classes and $35/group and can be offered 3x/week for maximum intensity. Price for classes from India will continue a $25/class/hour. Both Casual Non-Curriculum Based Lessons or Curriculum Based Lessons can be offered based on your need. – Slots start at 3:30 p.m., last slot starts 7:30 p.m.
Carnatic Music School, is currently accepting new students at all levels. New session starts after the Summer break from August 14th onwards. Visit http://www.CarnaticMusicSchool.com for more details. Call Sowmya at (954) 326-2928 to enroll now! Want to learn a to play a new instrument this summer? Try the mridangam (2 sided Indian percussion drum). Contact me for Beginner and Intermediate level mridangam lessons, and all other additional details. 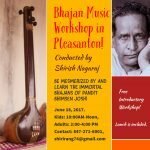 Hi all, I am conducting a Hindustani classical bhajan music workshop in Pleasanton on June 18th. I am a disciple of Pt. Dr. Nagaraj Rao Havaldar of the Kirana Gharana, belonging to the lineage of Bharat Ratna Pt. Bhimsen Joshi. This introductory workshop is free and participants will get an opportunity to learn bhajans in Hindi, Marathi and Kannada. Morning session is for kids and afternoon is for adults. Welcome to Music N Beyond, where kid’s grow up making music! Music & Beyond is the East Bay’s premier music school serving Dublin, Pleasanton, San Ramon, Livermore and beyond! Our experience is that music has a transformative power, and can enrich your life immensely. Studies have shown that musical prowess can increase aptitude for math and other subjects. The ability to play an instrument builds confidence and provides an opportunity to shine in social situations for a lifetime to come! And, above all else, learning to play an instrument is FUN! Music & Beyond offers private lessons and group instruction in a variety of instruments, such as piano, guitar, drums, voice, violin, trumpet, voice, ukulele and many more! Also, we prepared kids for certificate of Merit certification. Check us out at musicnbeyond.com. Tabla Classes for Beginners, for kids and adults – 10 sessions of one hour each, from starting March 4 until May 14, Amma’s center in the Castro Valley hills. Sign up soon, very reasonable rate. Read more at Tabla Classes at MA Center. 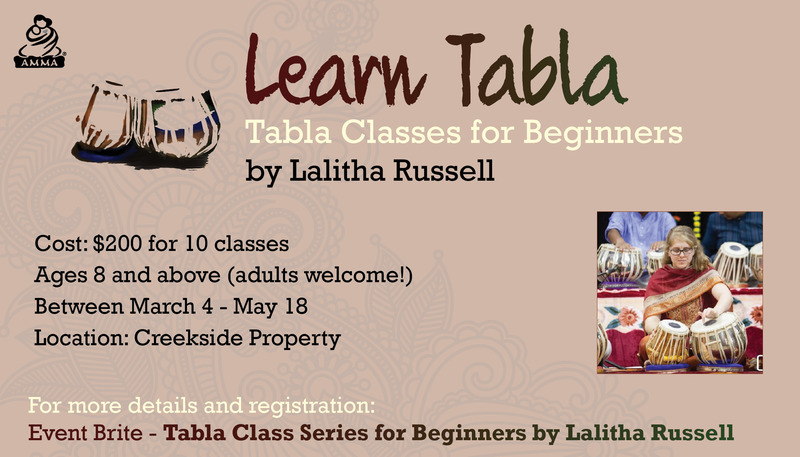 My name is Madhuri, I currently take Tabla lessons for Adult and Kids beginners in Pleasanton. Classes would be weekly and I am senior disciple of Tabla School in India. If you are interested, I am reachable at 925 699 0678 or e mail me at madhurijalawad…@y…com for further details. Carnatic Music School, is currently expanding classes and accepting new students (adults and kids at all levels). Visit http://www.CarnaticMusicSchool.com for more details and to signup for classes. – Slots start at 4:00 p.m., last slot starts 7:30 p.m. Interested in learning Light/Non-Classical Indian Music? I am a trained artist in Hindustani Classical music and am offering music lessons for kids 5yrs and above at my residence in East Dublin. Music is not only a great stress-buster, but helps kids build self-esteem and improve speech and presentation skills. Classes will focus on light classical and non-classical (Bollywood, bhajans, bhavgeet etc.) form of music and teach kids Shruti (scale) and Taal (rhythm). Please call 408-306-2310 to sign up for classes. Looking for a Tabla teacher in and around san ramon for adult beginner tabla.